The son of a civil engineer in Plainview, Texas, Larry Weaver studied math and physics at UT Austin, and served in the Peace Corps in Colombia, before he came to the UO for grad school in physics. "The research I did was in molecular biology, in Brian Matthews' lab," he says. "We studied the structure of proteins, using x-ray diffraction and a lot of math." Weaver got his PhD in 1978, did three years of research in Switzerland, then returned to work in the Matthews lab until he retired in 2005. Sheila Hale, a Quaker, was helping with a Salvadoran family taking sanctuary at the Eugene Friends Meeting House in 1984. Weaver was there as a translator. "We had one date," she says. "We haven't been apart since then." Hale went to grad school in mediation and worked as a mediator until the late 90s. The couple has lived on 14 acres along the Coast Fork of the Willamette, with a view of Creswell Butte, since 1987. 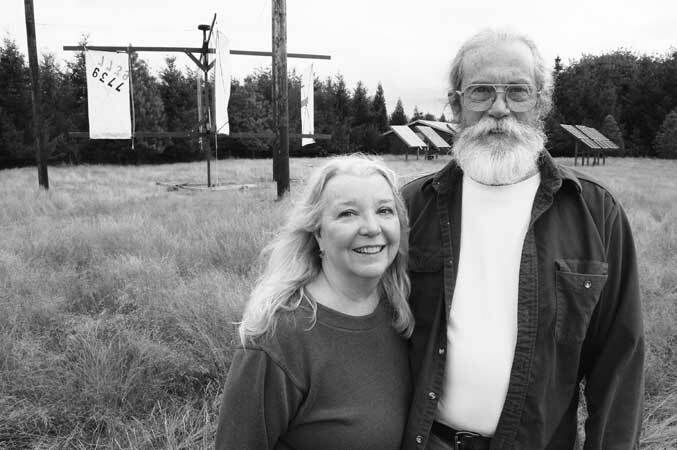 They purchased 72 acres on the butte in 1995, and worked with the McKenzie River Trust to craft a conservation easement, limiting future development. Weaver has since dug out "five lifetimes of blackberries" and planted thousands of trees on the butte. Over the past three years, he has built an array of 40 solar panels on the riverbank land. "It produces all we can use for the six sunny months," he says. "That includes our electric car," she adds. His current project is a vertical-axis wind turbine generator with hinged sailcloth panels to catch the breeze.